This category includes the most popular tartan and clan crest products. Other tartan and clan crest items can be found in the "Clothing" and "Accessories" departments. Please note that not everything is available in all names. The names that are available for a particular product are shown in the drop-down list for that product. Tartan items are available in both Clan names and District names, as well as some of the more generic tartans such as Black Watch. For men's kilts, please look under "Highland Wear." For women's tartan skirts, please look under "Clothing - Women's Skirts." Pewter Belt buckle with clan crest, by Gaelic Themes. Choose the clan name from the dropdown list. This Clan Crest Dress Sgian Dubh by Gaelic Themes features a clan badge with your clan name, a Thistle handle design, and a stone top. Choose the clan name and stone color from the drop down lists. 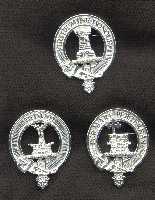 Pewter Kilt Pins by Gaelic Themes. Each pin is made from 100% lead-free pewter and hand polished and antiqued to a high luster. Select your clan name from the dropdown list. Baseball type caps with 100% wool tartan bills, plain green cotton body, size adjustable. See list of available tartans. 100% Wool, Made in Scotland by Ingles-Buchan. Elastic band allows "one size fits all." Cap badge with Clan crest - silver plated. 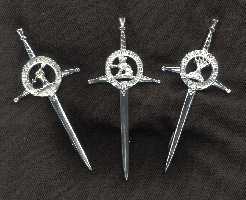 Kilt pin with Clan crest - silver plated. Various Authors. Small format books with a lot of information about each clan. Softcover, Illustrated, about 30 pages each. Click the title to see the list of clans available. Various Authors. Each book has the clan name and crest on the front and has the story of that clan. Softcover, Illustrated, about 35 pages each. Click the title to see the list of clans available. 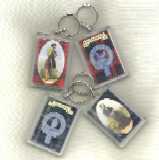 Clan Key Ring with Clan Badge and Tartan on one side, an old-tme clansman or -woman on the other.